Heads Up For Tails is one of India’s luxury brands for pets. With more than 4,000 products that are available, they research, design and develop products to help pet parents indulge their pets. Their products range from pet clothes to accessories, pet grooming products to treats and even food. They also customise products as per your pets’ needs, so you get things like special occasion wear, cushions and cushion covers, dog beds, collars, name tags, mats, plaques and much more. So now, after being available only online for Mumbai customers, they have opened a physical store in Worli’s Atria Mall. The store sells products including pet food, treats, apparel, toys, accessories, bowls, beds and a lot more. Aside from offering products from its own label, the store will also sell products from other popular pet brands and focus on quality as well as variety. The brand has also launched a Human-Doggy collection, in association with fashion label RIDRESS. This collection boasts of tops, shirts and dresses for women and shirts, bowties and bandanas for the dogs. They will both be made out of the same fabric (mix of cotton & denim) and will have the same design and prints. 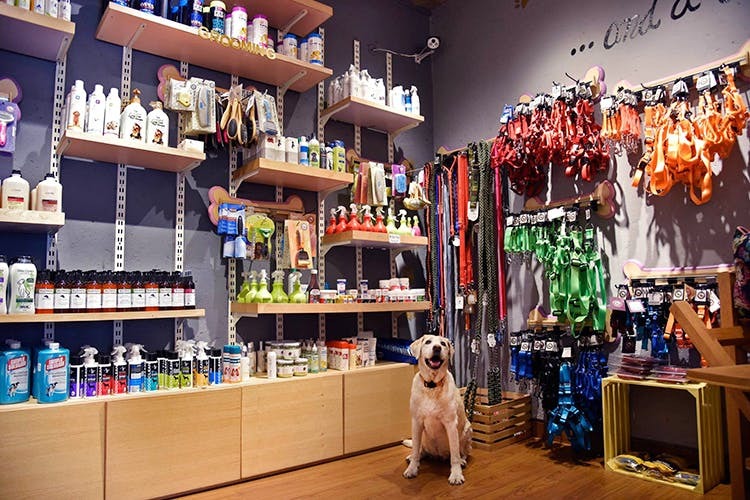 They have products ranging from INR 100 (their smallest size of Yak Chew comes at INR 99) to high-end dog and cat furniture which can go up to INR 25,000. Heads Up For Tails is the perfect destination for you and your furry friend, as they offer pet food, toys & treats, apparel, accessories, collars, leashes & harnesses, grooming products, bowls, beds, mattresses, blankets and much more. They also cater to the needs of pets like rabbits, guinea pigs, hamsters, squirrels, fish and birds. Head there and get a chance to thoroughly pamper your pet!